Yeti 1000 charging MacBook air. ~60 watts output, with our Boulder 30 Panel inputting ~20 watts in full sun. It has 1000 watt hours of storage. So we could run a thing at 100 watts for 10 hours, or different thing at 1000 watts for one hour on the battery alone (no solar input). We will be able to get even more usage out of this battery with our panels pushing power in. Boulder 30 (left) and Escape 30 (right). Both outputting ~24 watts when angled well in full sun. We also ordered a Boulder 100 solar panel to power this new beast, but we've yet to receive it. For now, we're charging the Yeti 1000 with our Boulder 30 panel, and the 400 with our Escape 30 panel. I picked up the Escape 30 for free at the Rubber Tramp Rendezvous in Quartzite. I saw a guy walking over to the "free pile" and scooped it as soon as he set it down. I called Goal Zero and they sent me the legacy adapter cable for free! Yeti 400 Charging Biolite BaseLantern and iPhone SE. 19 watts input from Escape 30 Panel (old school). 17 watts output to BaseLantern and iPhone. We have used our Yeti 400 for over a year and it has been great. In conjunction with our Boulder 30w Panel, it powers both of our laptops, all of our lights, drone, cameras, speaker, fan and rechargeable batteries. The key has been modular power. Each of our appliances has an internal battery of its own, increasing our gross energy storage. When our Yeti is topped off, we plug in the other things, allowing us to make use of the power we generate beyond the main battery's capacity. I love the Goal Zero Yeti "solar generators" for their simple all-in-one designs. The portability of the battery and panel helps us find sun in heavily shaded areas. The LCD screen has been a great learning tool. I can toggle the output between amps, volts, and watts. This simple interface has demystified electricity greatly for me. The input readout is also great for finding the optimal angle and position for the panel. With the lithium models becoming more popular, the price of the older model AGM (absorbent glass mat) batteries will likely creep down. People may also be selling their older systems to upgrade to lithium. Keep an eye out on Craigslist and Facebook Marketplace to scoop one up. If the internal battery is damaged, replacement batteries for the 400 are $100, and $50 for the 150. Keep in mind, the 150 does not have an LCD readout for Input or output wattage. The little screen simply displays battery capacity. If I were to do it all over again on a budget, I'd probably get the Yeti 150 - $200. For solar panels, I would prowl the internet for a used Goal Zero panel. Even something legacy (like our Escape 30) would work great for this little guy. Before you buy an old panel, make sure it's compatible. The Yeti 150 with a 30 watt panel would likely be enough power for one person with a decent amount of technology (iPad, Mac, Phone, Lights, Speaker, Fan, etc) to live pretty comfortably. My MacBook air has a 50 watt hour battery. So this little guy could charge my Mac about 2x without charge. With a 30 watt panel (assuming 25 watts output), I could regain the draw from my 50 watt hour battery in 2 hours of sunlight. The beauty of this little system would be it's modularity. The 150 only weighs 12lbs. A great portable battery station for charging out in the field. This small system would still be a useful supplemental battery bank, if I were to upgrade to a bigger system. The Yeti 400 (AGM) is the battery we've used for the last year. The Yeti 400 and Boulder 50 Package is a good deal considering how capable this system is. We did just fine powering all of our things with just the Boulder 30 panel, a 50 would be even more capable. The downside of the AGM 400 is its weight (29lbs) and max wattage output (300watts). This is the new version of our Yeti 400 (AGM) and the baby brother of our new Yeti 1000 Lithium. The Yeti 400 Lithium weighs only 17 pounds and has a max surge output of 1200 watts. The surge output means it will allow spikes to 1200 watts for very short periods of time, think blenders, drills, etc. 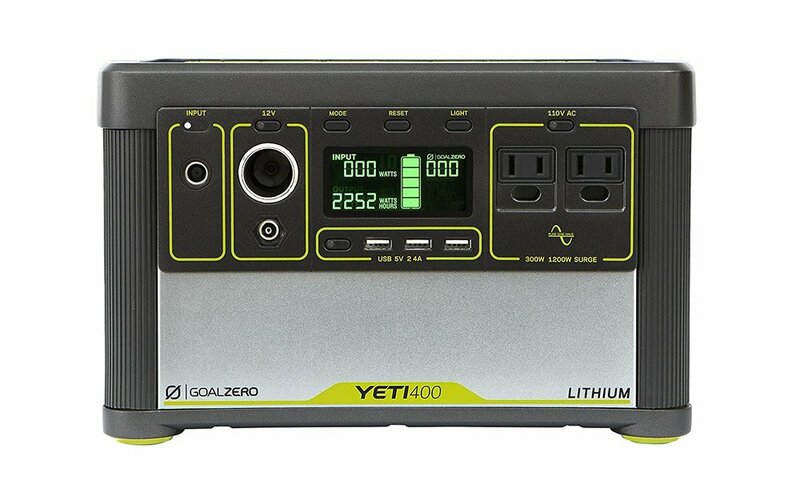 If I were to begin again with my solar system, and had the cash, I think the Yeti 400 Lithium would make the most sense. The kit with the Boulder 50 panel would be excellent for most applications. If you don't want to spend $125 on the Boulder 50 panel, look around for a used 30, 50, or 100 watt Goal Zero Panel. The only downside I've seen to lithium batteries is that extreme cold can impact their capacity. Think skiing/riding with a lithium powered cell phone, when they get too cold they get dead. We will have to be more diligent to keep our new Yeti 1000 warm in below freezing temps. The Yeti 1000 is truly overkill for us, we probably wouldn't have bought one if we didn't find the open box deal for such a great price. I'm excited though for the possibilities it unlocks. I'm currently looking into ice makers, mini electric heaters, electric kettles and more. Even if you have all of the money, I would start with a smaller system to see what all you really need. If you do have higher draw items, electric bike, boosted board, power tools, or other high draw items you may need to look into the Yeti 1400 Lithium, the grandaddy Yeti 3000 Lithium, or (in odd scenarios) the Yeti 1250 (AGM). I only mentioned Goal Zero stuff here because I'm familiar with and prefer their products. You can probably build a similar system for less money, buying your battery, solar controller, inverter, peripheral ports, etc. DIY systems are viable option. I equate it to building computers vs buying a Mac. In some situations building a PC makes more sense. But for my situation, I'd rather pay the premium for the Mac. Same goes for the GZ systems, they're a bit more expensive, but the build quality and modularity are worth it to me. If you have experience building other systems and want to tell me / other people about it, feel free to comment below!